Canadian historian Chris Laursen looks at a classy old-fashioned ghost story brought to the silver screen in 2001, Alejandro Amenábar’s The Others. How rare it is for a ghost story to be brought to the big screen in classic form. In 2001, Chilean-born director Alejandro Amenábar made The Others, an eerie story of a haunting reminiscent of film noir and golden age horror from the 1930s and 40s. His first English-language movie, The Others stars Nicole Kidman as a God-fearing strict mother, Grace, who is on the edge as she protects her two young children, Anne and Nicholas, from the sunlight. The children suffer from xeroderma pigmentosum, a real-life rare ailment which results in extreme burns for those who have it when they are exposed to direct sun or bright artificial light. Constantly, Grace is locking all of the doors of the large manor her family occupies to ensure that the children don’t accidentally step into a lit room. When the children move to other rooms in the house, she makes certain the curtains are drawn shut before they enter. It makes the entire house gloomy and dark. An unrelenting thick fog outside already makes for a murky environ. A tale that takes place during wartime, Grace’s husband Charles has been fighting at the front and she has been anxious for his return. The servants she had suddenly disappeared one day without notice of leave, forcing Grace to take care of the house and her children on her own. That is until a trio of new servants arrive in response to a newspaper ad she posted. 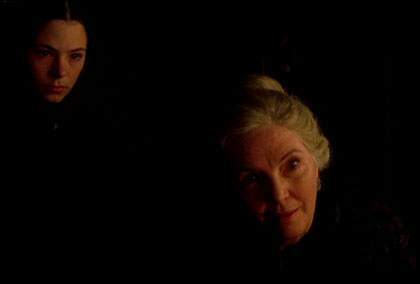 Fionnula Flanagan (right) and Elaine Cassidy as two servants who are withholding information from Grace. Bertha Mills (played wonderfully by Irish actress Fionnula Flanagan) leads the trio, also made up of gardener and handyman Edmond Tuttle and a young mute servant girl named Lydia. The new servants quickly are informed of the extraordinary conditions of their posting, and Grace cautiously offers Mrs. Mills a set of keys to access the various rooms with the stark warning that if she were to ever leave one unlocked, it would endanger the health of her children. But there is even more going on in the large country home. There seems to be someone else there. Someone unseen. Grace hears things in the house, and the children seem to know about who is responsible. Anne has seen a boy named Victor who claims it is his house. But how could someone else be in the house without being seen? Grace, already near panic over all of her anxieties, is not sure whether or not to believe Anne. At first, she accuses Anne of fibbing and punishes her. But as time progresses, more strange things happen around the house. Invisible intruders threaten the sanctity of Grace’s fragile manor. Grace (played by Nicole Kidman) knows there are troubling things happening in her family’s home, and is determined to make it stop. This is a truly wonderful movie. It has the same pacing and suspense as classic horror films from the golden age of cinema, and Nicole Kidman plays Grace quite well for the cinematic era depicted. The last thing this woman needs is for ghosts to add a further threat to her fragile children, and it spins her life out of control. Alejandro Amenábar is famous for making psychological thrillers. His international success was Abre los ojos (Open Your Eyes, 1997), a film with many twists and turns, not far from the works of Pedro Almodovar (most recently known for the movie Volver). Tesis (Thesis, 1996) was a shocking movie about a serial killer. Most recently, he made Mar adentro (The Sea Inside, 2004), a true story of Ramon Sampedro’s 30-year campaign in support of the right to die for those with terminal illness. In The Others, he adds to the incredible Spanish and Latin American presence in fantasy cinema which also features the wonderful Guillermo del Toro (Pan’s Labyrinth, The Devil’s Backbone) and Alfonso Cuarón (Children of Men).